Spotted – Chinglish on London’s Underground! 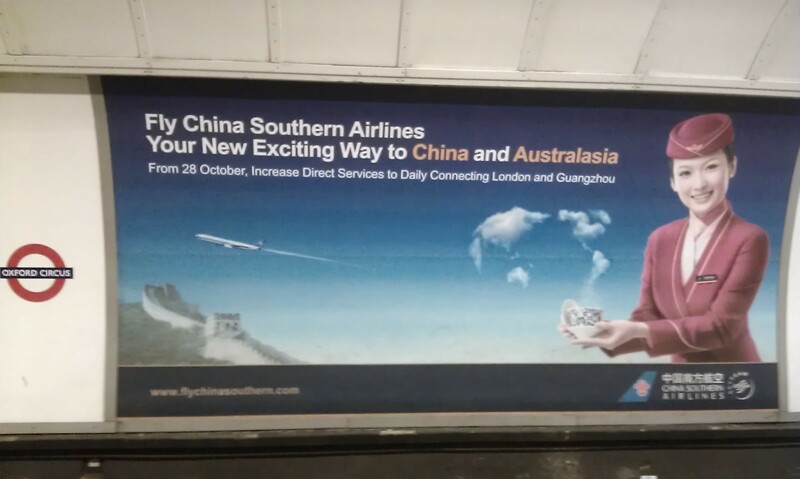 I spotted this advert by China Southern Airlines in Oxford Circus underground station (Victoria Line, Southbound) at the weekend. Have you spotted the mistake(s) yet? Woah, checkout that third sentence! Here it is again, up close. (I’m going to ignore the use of ‘New Exciting Way’ in the second sentence… and just chew on my nails instead). Horrible. What would Don Draper say? This advert is placed in a prime spot in one of the busiest underground stations in London. Hundreds of thousands of people will see this advert. I don’t know whether China Southern Airlines just used Baidu Translate, or whether it was written by a Chinese copywriter who speaks rudimentary English. There is always the option that it was written by an English copywriter and then later edited by an overzealous Chinese copywriter. This was something I experienced multiple times when I worked for a creative agency in Beijing. We had a Chinese client who had us working on an international campaign and producing all the copy in English. One of the client’s employees used to edit my English copy. She would take my final copy and completely mangle it by removing prepositions, changing verb tenses and adding in Chinglish phrases, with the mistaken belief that she was making it more colourful (a very popular English adjective in China). And these weren’t suggestions, this was after copy had been approved and had sign off. In the World of Advertising, making changes after sign off is on par with [insert a terrible crime]. However, we always battled to get these changes undone before letting our design team near it. Well, whatever happened, who knows what they were thinking by not double-checking that their advert (especially the key sentence) contained no mistakes or made sense to their target audience! ← Mend it like Beckham – can David Beckham revive China’s football league? Ha ha, as an aspiring copywriter this did make me laugh. It made me die a little inside. Enter your email address here to receive email notifications of fabulous new posts!